Islandista: Out of order, Kamla! Well, well, well looka this though! "We will have to look at ways in which we would be able to assist. But you would recall my comments earlier this year, when I said there must some way in which Trinidad and Tobago would also benefit. So if we are giving assistance with housing for example, and that is one of the areas that we (Prime Minister of St Vincent and myself ) spoke about, ... then we may be able to use Trinidad and Tobago builders and companies, so that whatever money or assistance is given, redounds back in some measure to the people of Trinidad and Tobago." Naturally, her comments are causing outrage up and down the Caribbean. Many are saying while they understand and don't even object to the sentiment behind it (aid with conditions is nothing new after all - look every stadium or office block the Chinese build in the region is done by Chinese companies and with Chinese workers to boot) but the way she said it and when she said were completely out of order. 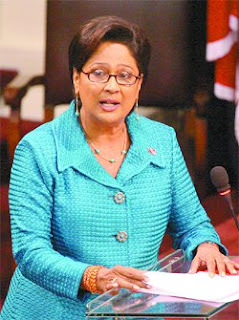 And we here at Islandista agree, though we are not surprised, because Kamla has made her anti-CARICOM stance very clear in a set of mouthings for much of this year- starting with infamous "ATM" comment earlier this year and continuing with her kvetching about the expense of the CCJ being based in Trinidad - after HER PARTY, the UNC lobbied for it to be there in the 90s. Her comments are crass, short-sighted and disgracefully unCaribbean for a woman who lived in Jamaica for 14 years and drew a salary from the Jamaican people for at least 10 of those years. Not only that, they are flat out stupid. "Some way in which Trinidad must benefit?" As the Express rightly pointed out in its editorial today, CARICOM countries "take about 10 per cent of Trinidad's exports." Trinidad, more than any other CARICOM country, has been benefiting for years from intra-regional trade. What if the citizenry of these countries were so offended that they decided to take the aid but boycott Trinidad's goods? Simply put, words mean something and Kamla should have chosen her words more carefully before biting one of the hands that feeds her people.